The French auto industry is going through hard times. There are less and less cars built in France each year, and PSA Peugeot-Citroën has just announced 8,000 layoffs. The company plans to close a large factory in Aulnay sous Bois (just North-East of Paris), where the Citroen C3 is built, and this caused so much turmoil, that the French government said it will look into the issue. Unsurprisingly, it cannot do much, and the measures announced in its Plan Automobile don’t say anything about the planned factory closure. What the government will do instead, is more towards green cars. Those who had hoped for something imaginative won’t get it. The biggest thing is a revision of France’s bonus-malus (Latin for good-bad) system. Buyers of an energy-efficient car get a financial reward, while those who buy a gas-guzzler have to pay a penalty. By example, drivers who buy a car whose CO2 emissions are between 60 and 90 grams per km, will get a €550 ($680) cash incentive. Hybrid car buyers will get much more, up to €4,000 ($4,950), though it is limited at 10% of the new car’s price. So buyers of a small Toyota Yaris hybrid will not get the full €4,000. Better get a Prius to get a larger bonus! The electric car will be even more actively supported. Actual bonus is €5,000 ($6,188), it will be raised to €7,000 ($8,663). Quite substantial, especially considering that it comes without any kind of limit, or restriction related to the car’s price. The base Renault Zoe, available this Autumn, will start below €21,000 (battery not included), but the new bonus will push that price below €14,000. 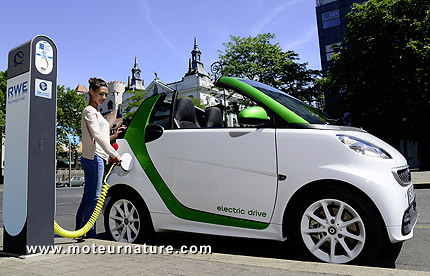 The government has also announced a budget for French car companies and their suppliers investing in green technologies. About $600 million are available on a short notice. Quite nice, but so many people were expecting more. The French government is quite lucky. The electric Renault Kangoo and the little Smart Fortwo are built in France, and so will the upcoming Renault Zoe. But all in old factories, and there would be a lot to do to convince the automotive industry that France is a good place to start a new factory.